Yep, still playing catch-up on posts, but I’m almost caught up. This is the last meal husband made before heading out to work. 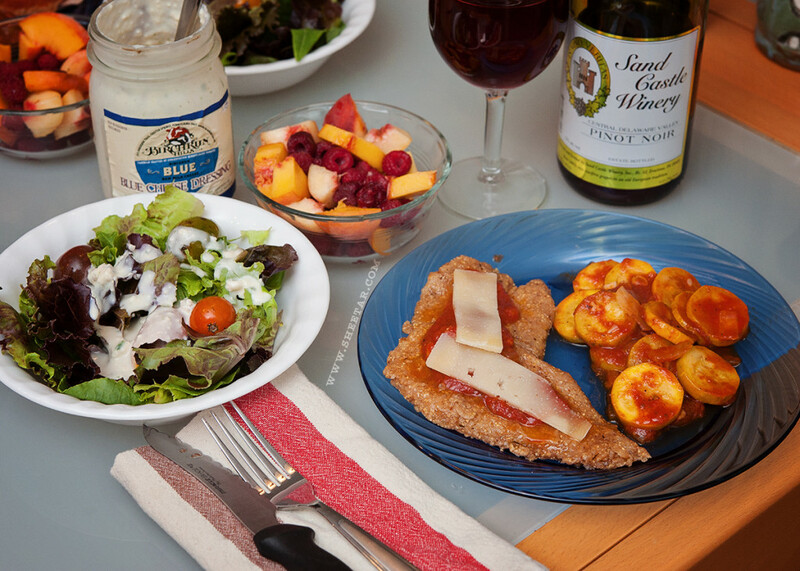 It’s basically veal parmigiana with squash, a salad, and a bowl of peaches and raspberries. The veal was breaded with flour and a little cornmeal, double dipped in buttermilk, and fried up in a cast iron skillet with lard. The sauce we had made from local tomatoes in a large batch and had plenty left around for this dinner. 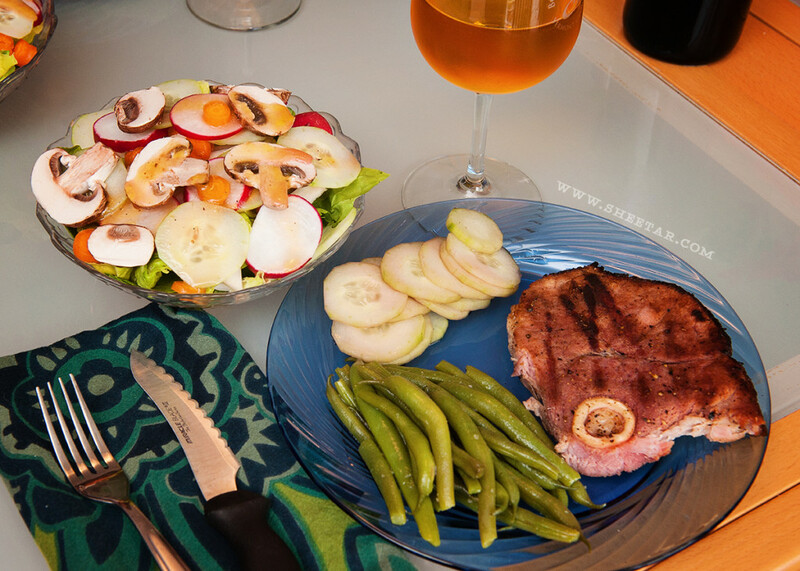 We added sliced squash to the sauce to cook up as a side to the veal, and finished off the whole thing with a glass of Pinot Noir. A pretty substantial meal for a One Local Summer dinner, and every bit of it delicious. PASTA! One of my favorites. We had a few leftover jalapenos from prior dinners and husband thought, hey, jalapeno pasta! I thought hey, that sounds like a fun thing, until I realized, later, that when you puree jalapenos, you basically make liquid pepper spray and aerosolize a little bit of it into the air when using the stick blender. Suddenly, it was not such a fun thing. However, already having the jalapeno puree in progress, I soldiered on and finished the pasta which did lend a nice spice to the dinner. Not something I’d do again (I learned my lesson the hard way). The sauce was made from local tomatoes in a gigantic batch along with peppers and onions. 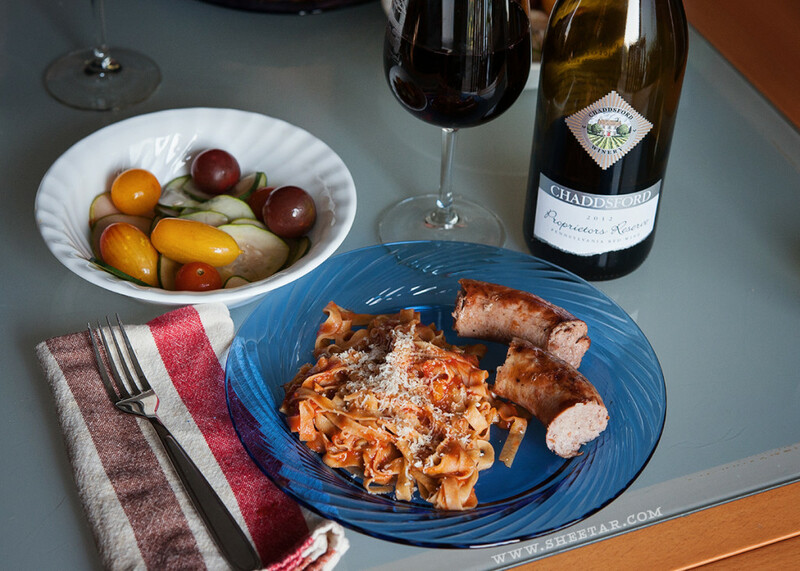 The plate was completed with pork Italian sausage. It’s a pretty basic, classic sort of meal, but this is comfort food to me, coming from an Italian background. Add that now almost mandatory tomatoes and cucumbers salad and a glass of wine and that’s a meal! We’ve gotten rather ahead of ourselves with One Local Summer, so I’m going to double up this week with two posts to get back on track. Sometimes we just cook local meals by default and then I forget what week we’re on and things all go crazy. I figure doing extra local meals isn’t a bad thing and since we made them, I might as well share them! So, here’s a catchup post and in two weeks I’ll be all caught up, I hope. We dug into the freezer for this one and found a Bison roast. Husband rubbed it down with freshly ground pepper and salt and put it on the rotisserie on the grill. While I realize it may be blasphemous to red meat eaters, the end chunk was cooked nicely well done (brown the whole way through) but was still tender and DELICIOUS. 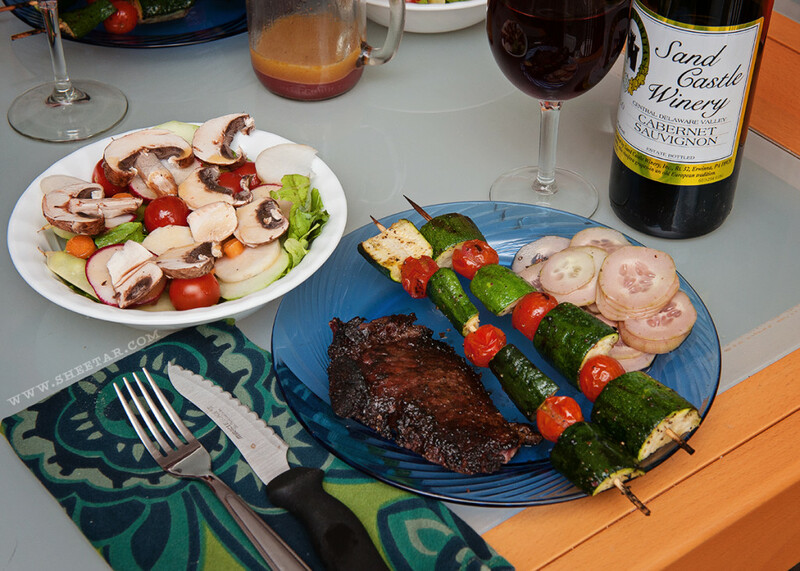 Also cooked on the grill were those skewers with zucchini and tomatoes, covered in olive oil, salt, and pepper, then there’s a cucumber salad with red wine and vinegar, and finally the salad bowl just like every week, with the same mix of greens and vegetables. It all came out great, and we found a local Cabernet Sauvignon to pair with the dinner. MORE PORK! Yes, we’re big fans of the pig meat, but this meal was so filling that I only managed to make it through about half of that chunk of meat on the plate. It’s probably the fault of the overflowing salad bowl, but that’s the way I like it! I’m always doing salad prep while husband is out running the grill, so sometimes I get a little overzealous, today being no exception. In the salad bowl is lettuce, turnips, radishes, mushrooms, cucumbers, and carrots along with the same not-local-but-homemade dressing we’ve been using. It’s just olive oil, homemade vinegar, and a little bit of red wine, but it works great and is simple enough to not overpower the awesome vegetables in the bowl. Going around the plate we have a Ham Steak which was really really great – cooked up nicely on the grill, rubbed with pepper, salt, and a little maple sugar. Then there are steamed green beens with sea salt, and a cucumber salad made by soaking the cucumbers in vinegar, red wine, and a little crushed pepper. We cracked open a bottle of our homebrewed PA Maple Reserve which is actually all local except for the yeast – local cider, local maple syrup, all fermented into a really delicious wine.